Financial planning, score-carding, and analysis software, the latest iteration of the TM1 platform. Provides an interactive, customizable workspace that can be deployed to all cost center owners and business managers to deliver a consistent view of KPIs. Enables you to leverage data and metadata from SAP Business Warehouse (BW) Oracle Hyperion, IBM TM1 and other applications. 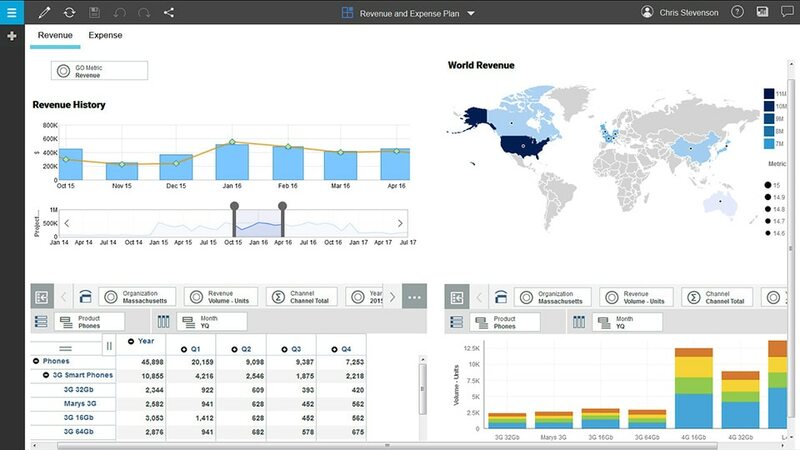 Built on the powerful, in-memory IBM TM1 OLAP engine to provide real-time insights across your business dimensions, at the level of detail you need. Uncovers predictive insights automatically – directly from internal or external data – to let you test business assumptions and examine alternatives. Deployable on cloud, on premises or in mixed deployment environments for use by individuals, teams, workgroups and the entire enterprise. Helps you perform dimensional analysis and calculations for the most demanding profitability and scenario analytics. Finance teams need to reduce their reliance on error-prone spreadsheets so they can focus on activities that add real value. IBM Planning Analytics enables finance teams to consolidate their data sources and build reliable rolling forecasts in a fraction of the time. In a fast moving retail environment, stock outs can mean the difference between profits and lost sales. IBM Planning Analytics can help retailers analyze inventory levels, optimize purchasing and keep stores fully stocked with the most desirable items, boosting sales and keeping customers satisfied.